On May 15, voters in the 1st Senate District and 42nd Assembly district went to the polls to select their nominees for the June 12th special elections. In the 1st Senate District, which includes Door and Kewaunee Counties and parts of Brown, Calumet and Manitowoc Counties, State Representative Andre Jacque defeated Green Bay resident and factory worker Alex Renard by 330 votes for the Republican nomination. The primary race was highly contested by the two candidates, and political spectators noted the campaigns were heated at times. However, in speaking to reporters, Jacque was willing to leave those issues behind and proceed to the general election as a united Republican party. There was no Democratic primary in the 1st Senate District, as Sturgeon Bay Democrat Caleb Frostman ran without a primary opponent. Frostman previously served as Executive Director of the Door County Economic Development Corporation. Lodi businessman Jon Plumer handily won the Republican primary in the 42nd Assembly District with 70 percent of the vote. The district includes parts of Dane, Columbia, Dodge, Fond du Lac, Green Lake, and Marquette Counties. Similar to the 1st Senate District, there was not a Democratic primary in the 42nd Assembly District. Lodi Democrat Ann Groves Lloyd ran without primary opposition. The special election in both districts is scheduled for June 12th. All eyes will be on the outcome of those elections as they may serve as predictors for the November general election. Democrats hope ride a “Blue Wave” and flip both seats in their favor. 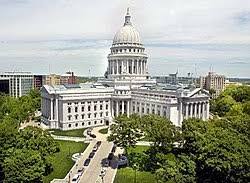 In late March, Dane County Circuit Court Judge Josann Reynolds ruled Governor Walker must call special elections in the two legislative districts. Both seats have been vacant since December when former Senator Frank Lasee and former Representative Keith Ripp resigned from the legislature to take positions in the administration.